New "For Purchase" item doesn't show up in "What's New"
1. 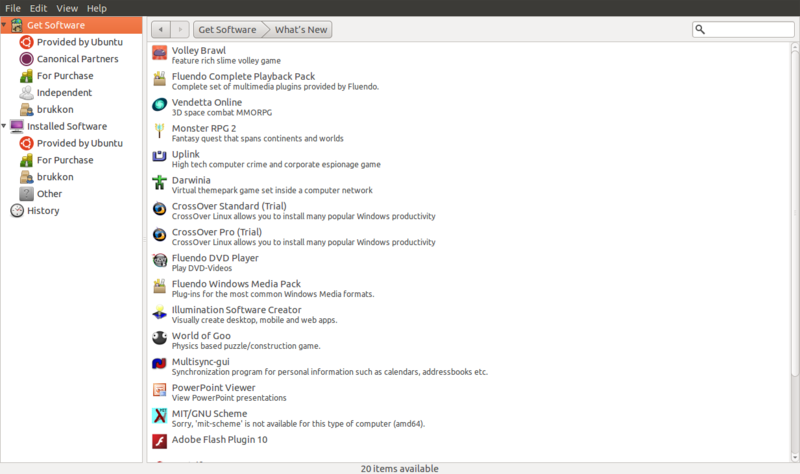 Shortly after something new appears in "For Purchase", navigate to "Get Software" > "What's New". What should happen: The new item is present. What actually happens: It isn't. For example, Vendetta Online appeared in "For Purchase" a day or two ago, but it's not in "What's New". Unfortunately, there is not a straightforward method for reproducing this error condition as it specifically requires a new for-purchase application to be deployed to the archives that we can then verify appears in the What's New section of the main screen (see description above). The best we can do for near-term testing, then, is to insure that there are no regressions. This can be done in the following way. 2. Install the version (3.0.9) from maverick-proposed. 3. 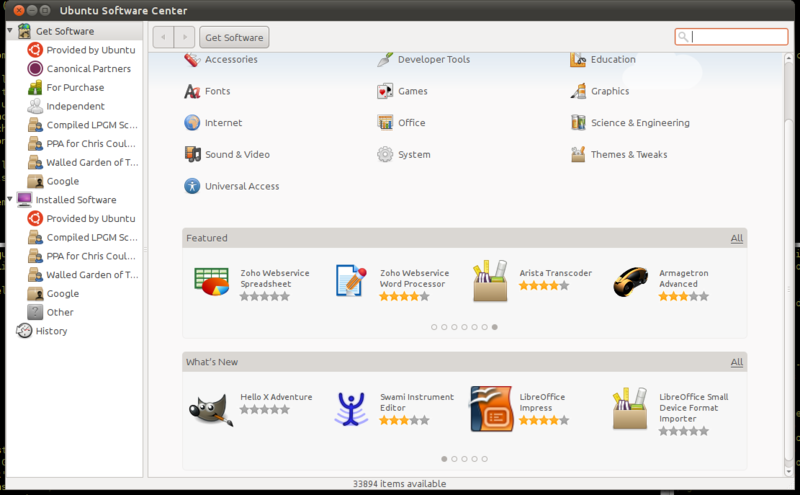 Open Software Center and check that at least one item is displayed in the What's New carousel of the main screen. 4. Click the "All" link in the What's New carousel. 5. Verify that the list of items is correctly displayed. 6. Select the first item in the list and click "More Info". 7. Verify that the details for the item are displayed correctly. 8. Navigate back to the list and check one or two other items. 9. 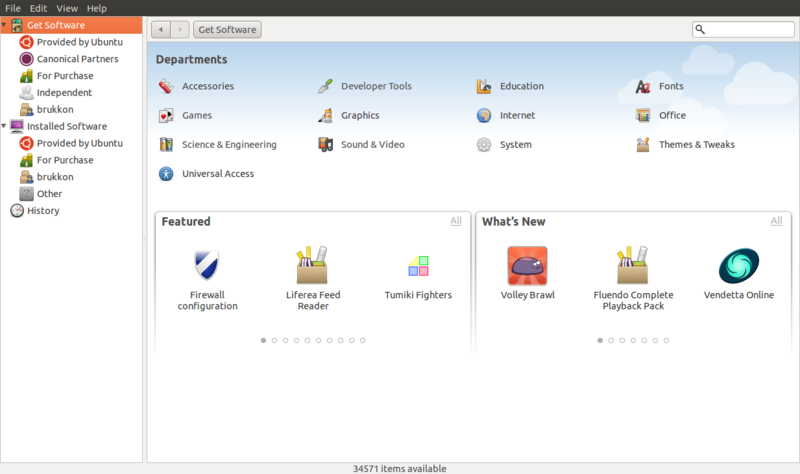 Verify that there are no crashes or problems in the display of items in What's New. Note 1: Unit tests for this feature are included and these tests pass for 3.0.9. Note 2: Today on my Maverick test machine running the upcoming 3.0.9 (with this fix), the new for-purchase app "Volley Brawl" showed up correctly in What's New (see attached screenshots). There are two bugs that I think are important enough to be fixed in 3.1 along with the introduction of ratings and reviews. Bug 639701 is one. This is the other. What's New" is one of the most noticable elements when USC is first launched, it's not doing what it claims to be doing, and it's quite possibly costing purchases. Screenshot showing natty's test for-purchase app Hello X Adventure now showing up in What's New (taken while running the attached branch). I've verified the fix in maverick-proposed per the stated test procedure and all seems fine. Thanks!